Installing SATA drives is much simpler than installing IDE hard drives because SATA drives don’t have any master and slave jumper settings to fiddle with. With SATA, the wires fit only one way — brilliantly simple. 1Turn off your computer, unplug it from the wall, and crack open the case. You may have to refer to the computer manufacturer’s instructions, but most cases have four or six screws on the back. Remove them and the sides usually slide off. 2Find an empty 3.5-inch spot for your new hard drive. Look for a location that isn’t right next to another piece of hardware. Keeping distance improves air flow and makes inserting and removing the drive easier. 3Slide the drive into the bay and gently screw the drive into place using four screws. Make sure that the electrical connections are pointed outward so that you can get to them. Some computer cases just use a slider tab to secure the drive. Be sure to touch your screwdriver against something metallic other than your computer to get rid of any built up static electricity. If the static zaps your computer, you might fry your system. 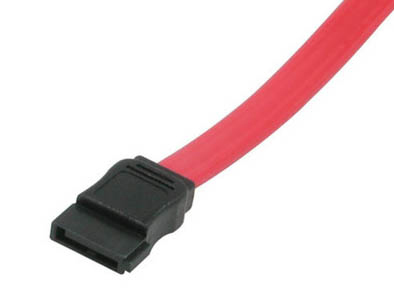 4Connect a SATA power cable to a power connector inside your computer, and then slide the other end onto the hard drive. A SATA drive needs two cables. The wider one is for power. 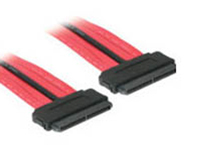 5Connect one end of a SATA data cable to your hard drive and the other end to a SATA slot on your motherboard. The narrower cable is for data. You can use any available SATA slot. 6Close your computer case and turn on the power. 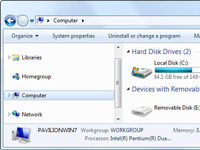 When Windows 7 comes back up, it identifies the SATA drive and automatically installs the drivers. 7Click the Start button, right-click Computer, and choose Manage. You see the MMC open with system management tools shown. 8Under the Name heading in the middle, double-click Storage and then double-click Disk Management (Local). 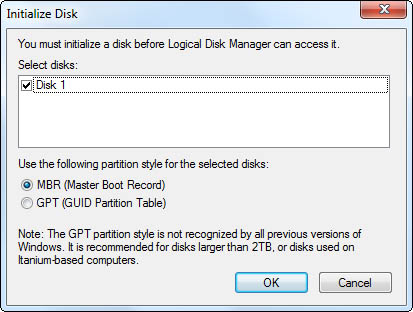 Windows 7 presents you with the Initialize Disk dialog box. Windows starts numbering drives at zero (which is the C drive), so your new disk probably shows up as Disk 1 or 2. 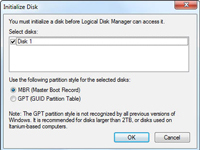 9Select the MBR (master boot record) partition style option and then click OK.
Windows 7 will either start the New Simple Volume Wizard or show you the Computer Management screen. 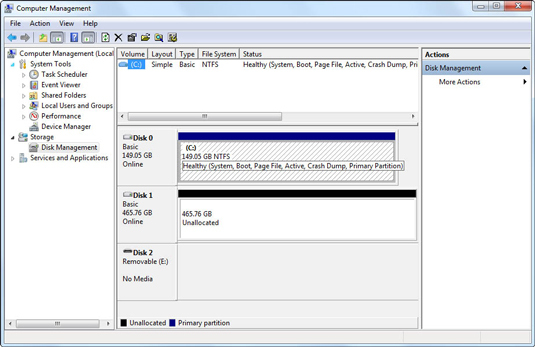 10If the wizard doesn't start right away, right-click the Unallocated partition and choose New Simple Volume. 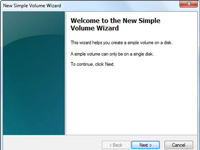 This step gets the New Simple Volume Wizard going. 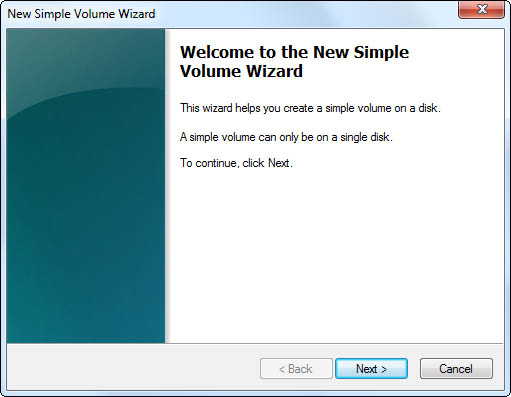 11Use the wizard to give the new drive a letter, format the volume (use NTFS), and use a Quick Format. Click the Finish button. Doing a full format of a new hard drive can take a long, long time; if you have a brand-new drive, a quick format suffices. 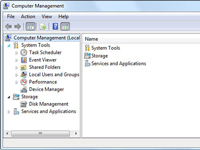 12When Windows 7 finishes, click the red X to close the Computer Management console. Your new SATA hard drive acquires the name New Volume and is ready for action.